Deputy Chief Minister of Arunachal Pradesh Chowna Mein called on Nitin Gadkari, Union Minister of Road Transport, Highways & Shipping at New Delhi on Tuesday and discussed on important issues related to Roads and Bridges in the state of Arunachal Pradesh. In the meeting, Chowna Mein sought for Notification of 4 Nos. of State Roads as National Highway, namely Akajan-Likabali-Bame (120 km), Margherita-Changlang (44 km), Daporijo-Gerukamukh / Dullungmukh (125 km) and Tezu-Chapakhowa via Sunpura ( 59 km) at the earliest. These four numbers of roads aggregating to 348 km has been declared as National Highways in-Principle during the visit of Union Minister of RTH & S to the state on 31st January 2017. Mein informed that NHIDCL has been entrusted with preparation of DPR for these roads except for Akajan – Likabali – Bame road, which is under improvement to 2-lane standard under Arunachal Pradesh Package for Roads and Highways under Special Accelerated Road Development Programme (SARDP)-NE. However, the remaining 3 roads await finalisation of DPR by NHIDCL. Mein also proposed to actively consider funding of East-West Industrial Highway Corridor and Frontier Highway under Bharat Mala Program on priority while citing that these roads are vital for the economic upliftment of the people of the state as well as for all weather connectivity to the border areas. The proposed Highways are Bhairabkhund to Ruksin (431 km) under Phase-I, Mahadevpur to Kanubari (100 km) under Phase-II and the Arunachal Frontier Highway (1841 km). The Union Minister of Road, Transport and Highways have agreed to consider funding of East-West Industrial Highway Corridor from Bhairabkhund to Ruksin (431km) under Phase-I and Mahadevpur to Kanubari (100km) under Phase – II with a condition to the State Govt that it should made the land available free from any encumbrances for these roads. It was further informed that NH-315 (old NH-52B) between Mahadevpur and Kanubari is under implementation under the Arunachal Pradesh Package of (SARDP) -NE. 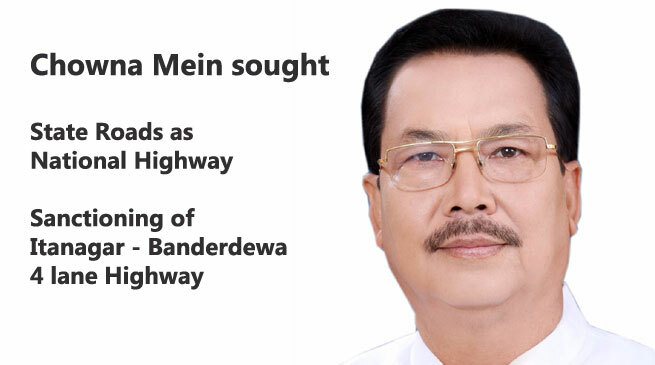 Mein also sought for approval of roads under SARDP-NE Phase ‘B’ aggregating 931 km for both Indo-Myanmar sector and State roads to which the Union Minister assured to examine and take up the matter on priority. He also updated the Union Minister that the SARPD-NE roads under Arunachal Package and Phase ‘A’ are in the various stages of completion and execution in Arunachal Pradesh. Union Minister informed that the Ministry had already set up a Committee under the Chairmanship of Director General (Road Development) & Special Secretary on February 2, 2017 to examine the cost economics and to suggest innovative materials/technologies to be adopted for the proposed Frontier Highway in the State of Arunachal Pradesh. It was informed that the first meeting of the Committee is likely to be held in the 1st week of June, 2017. It was also communicated that the Package –A for the length of 10 km for 4-Laning of NH-415 from Itanagar to Banderdewa has been sanctioned and awarded out of 30 km till date. Mein further requested to facilitate approval and sanctioning of remaining length (20 km) of Itanagar – Banderdewa road as Package – B & C to which the Union Minister assured to consider.